Button Down shirts and blouses are are “must haves” according to most style experts. However, many women have trouble getting a great fit. Buttondowns tend to gap at the bust line or pull across the tummy, giving an unflattering look. 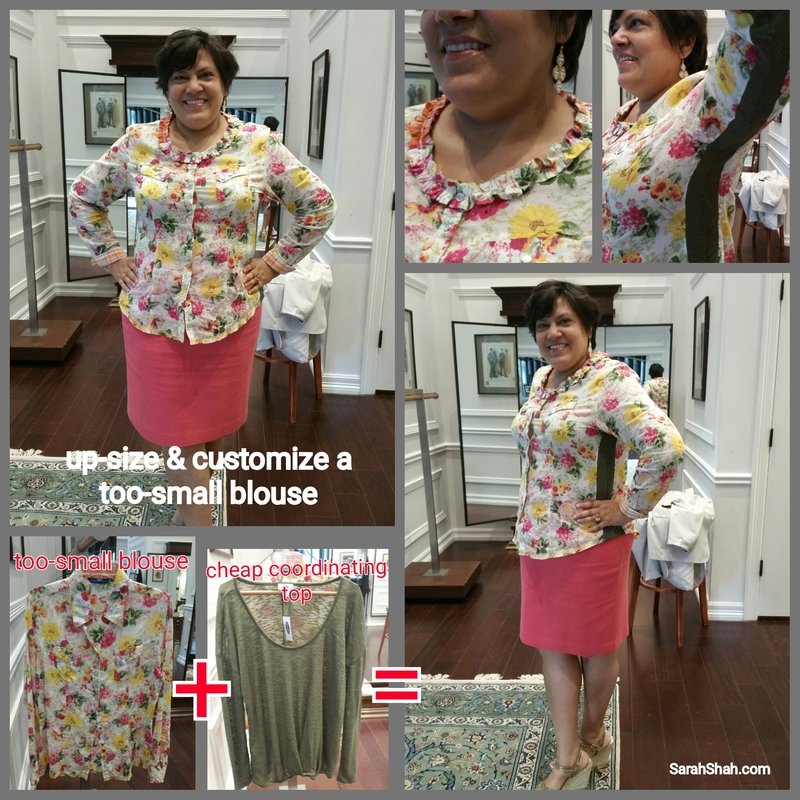 To get a good fit, look for shirts and blouses with a stretch panel in the side seams. This allows the shirt to stretch where you need it..in the bustline, tummy area, back…wherever. This Taos Top by Soft Surroundings has a stretch panel in the side seams that gives you a slim fit all over. The panel is made of a ribbed knit fabric in a color that matches the rest of the blouse so it’s invisible and stretches only where you need a little more room. If your shirt doesn’t have a stretch panel, it’s super easy to add one yourself or with the help of your tailor. Find a knit shirt such as a t-shirt, Henley shirt or lightweight knit top. Choose a top in a coordinating color with the same sleeve length. Look on sales racks and discount stores to keep the price low. Open the side seams and inside sleeve seams of the shirt. To make your stretch panel, cut a strip out of each side of the coordinating knit shirt. Be sure to keep the side seams. When you cut the strip, center the side/sleeve seams in the middle of the strips. Line up the hem, underarm sleeve seam and sleeve cuff and sew the side panels in place. Here’s an example of a George Roth shirt I modified with my tailor. I’m not a fan of a shirt collar, so we removed the collar, cut a scoop neckline and used the extra fabric to make a ruffle for the new neckline. Here’s an upsize of a t-shirt. Here’s an upsize of another button-down shirt.